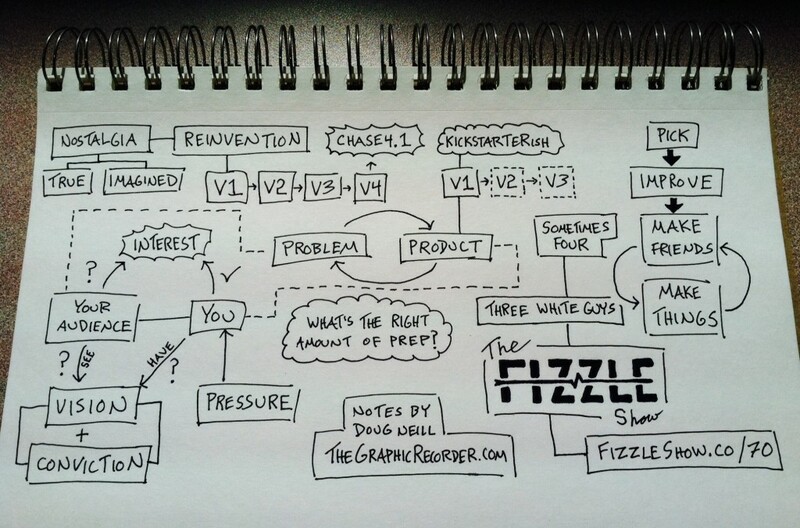 In this sketchnote I document a conversation on The Fizzle Show about how much you need to prepare before launching your next thing. Purpose: To capture the big ideas shared and to experiment with a new method of note taking – using only words and connectors. First, let’s talk process. I absolutely loved the constraint of words and connectors only while taking these notes – it’s the most I have enjoyed the process of note taking in a long time. It’s easy to see all of those beautiful sketchnotes out there and try to imitate their visual-heavy style, but when it comes to real-time visual note taking I think I prefer the style you see above. Next, the content. There are two things that stood out for me. The first is the reminder of the iterative nature of coming up with a solution to a particular problem that you’re trying to solve. In the case of building a business, your understanding of the problem itself as well as your understanding of the audience you’re serving improves as you make things and let people use those things you make. Each time you make a product, that product gets to interact with the problem it is intended to solve for the audience that your work serves. Only through that interaction will you learn what works and what doesn’t. The second piece that I really liked was an idea shared almost in passing – that you must pick something to focus on, improve you understanding of that thing, then go through the process of making friends and making things. It’s a simple model, but I think it describes entrepreneurship fairly well. Continue applying these ideas to the business that I’m building. About an hour after listening to this podcast episode and taking the notes shown above, I read something that reminded me of the idea of reinvention that was brought up during the show. That got me thinking about my notes, and I was happily surprised to find that I could build up the entire sketchnote in my mind. Every word, every connection. That shows the power of giving visual form to ideas – even when that visualness is simple boxes and lines laid out a page.